Skull Island 2nd Trailer Spoils The Movie’s Big Twist. The second trailer for Legendary Pictures’ upcoming King Kong movie, Kong: Skull Island, dropped during a Wednesday night episode of Jimmy Kimmel Live!, and the action-packed spot showed off a lot more of the great ape and the subterranean monsters he’s going to fight. The trailer, which kicks off to the tune of Creedence Clearwater Revival’s “Bad Moon Rising” to help set the 1970s vibe, shows that our heroes — played by Tom Hiddleston, Samuel L. Jackson, Brie Larson, and John Goodman — are headed to Skull Island, “the place where myth and science meet,” for a scientific test involving bombs. Unfortunately for them, once they get to the island, a giant bipedal gorilla swats them out of the sky. 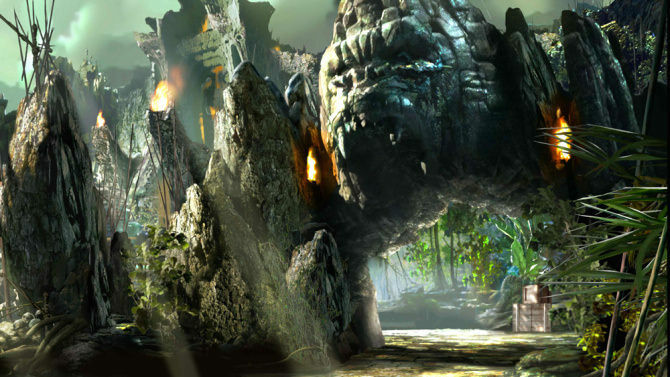 The survivors run into natives — and John C. Reilly’s character, who appears to have been stranded on Skull Island a long time ago. What they have to worry about are the Skullcrawlers that live below them. “Kong’s god on the island, but theres devils live below us,” Reilly explains. As evidenced by Reilly’s admission that “Skullcralwer” is a dumb name if you say it out loud, Kong: Skull Island doesn’t seem like it’s going to take itself too seriously. And that might be a good thing, because the giant monster visuals — especially Kong — are great in an almost corny, throwback to the ‘70s kind of way. Watch the new trailer below, and look for Kong: Skull Island in theaters on March 10, 2017.